We just arrived at the Disney Saratoga Springs Resort and Spa – thanks to a complimentary stay. The resort is part of the Disney World string of hotel properties and also one of the Disney Vacation Club Resorts. The Disney Saratoga Springs Resort is located across the lake from the new Disney Springs (formally Downtown Disney but rebranded in the Spring of 2016.) In fact, Disney Saratoga Springs resort is so close to Disney Springs, that you can walk to Disney Springs, via a walkway or take a five minute water taxi. Prior to our trip, I did some research on the resort and the reviews were mixed. The biggest issue many vacationers had with Disney Saratoga Springs was that it was not very Disney-esque. Compared to other Disney resorts, when you arrive at Disney Saratoga Springs, you don’t even know you are on Disney property. 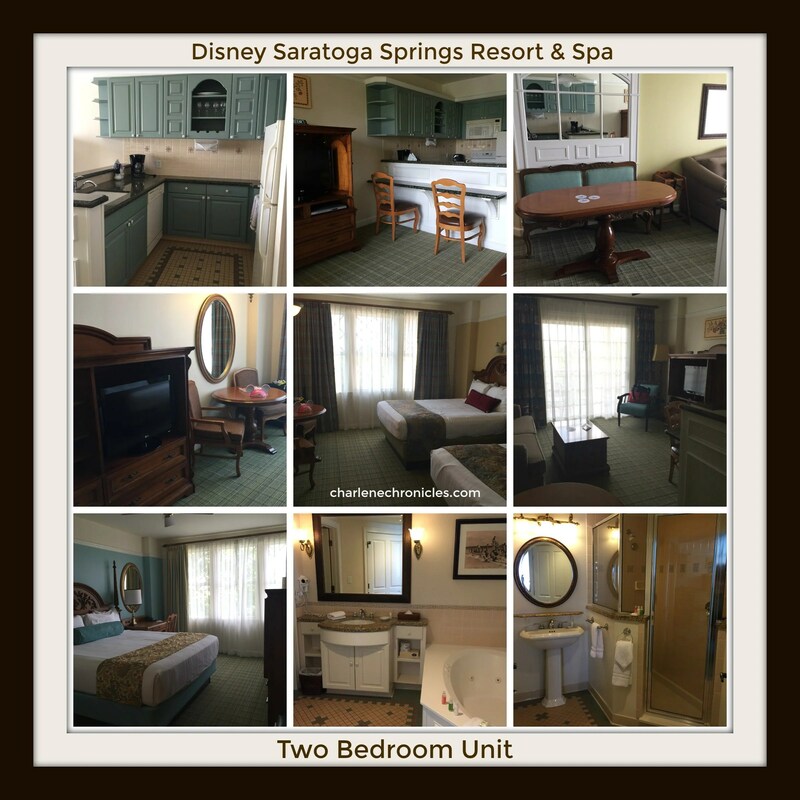 I’ve stayed off site in time-shares for many (many) years, and the Disney Saratoga Springs Resort and Spa is very much like the many time shares in the Orlando area. That is not necessarily a bad thing. However, if you want to be wisked away via pixie dust, this is not the resort for you. Other than the Disney items in the gift shop, or the Disney Transport buses going by, you wouldn’t know you were staying on Disney property. However, being time-share fans, we enjoyed it despite the lack of Disney paraphernalia. You get larger rooms and more in-room amenities. It makes it very convenient for families, because you can cook and prepare meals in your condo. There is a family room and a separate bedroom or two so it is easy for parents to stay up after the kids go to bed or for the grandparents to feel like they have their own space. Resort parking is easier as well, since parking is right outside of the buildings (unlike typical Disney resorts). It doesn’t add to the visual appeal, but it makes it easy to travel around the Disney Parks (parking is free at the Theme Parks when you stay on property) with car seats and strollers. While the Disney busing is great, there are times I just prefer getting to our car. We didn’t have a rental car while we stayed at the Disney Saratoga Resort, and I wished we did. At the Disney Saratoga Springs Resort, there are five Disney Transport Bus stops to service the Resort. It is that big. That doesn’t even include the Treehouse area that has its own bus that brings guests from there to the main part of the resort to access the Theme Parks. It often took a long time to get anywhere. It was nice that we didn’t have far to walk to the buses but being on the bus was a long ordeal. If my kids were any younger, it would have been a big deal. At 4 and 6, it was borderline but we were able to push through. There are five areas. Congress Park is to the right (or east) of the Carriage House (Check-in building) and is the area closest to Disney Springs so it is super easy to walk to Disney Springs, and it is also the part of the Resort closest to the water taxis to Disney Springs. The Springs area of the Resort is right behind the Carriage House (Check-in building) that I would suggest is the best for families with small children. This part of the resort is closest to the largest, family friendly pool (with kid-friendly water slides) as well as closest to the Water Taxis to Disney Springs. The Disney Transport Bus stop is super close, and it is close to the cafeteria (the Artist’s Palette), gift shop, restaurant (The Tuft Club Bar & Grill), registration (Carriage House) and the Disney Magical Express Bus. So it is center to everyone and everything you would need. There is the Treehouse area for those looking for a super secluded (but beautiful) location and need larger accommodations for larger families. The Grandstand (left, or west, of the Carriage House) is the first on the bus route for those looking for that benefit. The Carousel and the Paddock are the two locations at the ‘back’ (or North) of the Carriage House and I feel are the furthest from anything. Near the Paddock is pool that has a great waterside though, but this is the area for older families that don’t need (and maybe don’t want) the hustle and bustle of the main part of the Resort. However, going back to the lack of the Disney amenities. We didn’t miss it and valued the space and function over the decor. While the theme of resort is horses (from the actual Saratoga Springs in New York known for horse racing) at the turn of the century, at least they carry it through. Plus, you get the service from Disney you expect at checkin, busing, extra magic hours, magic bands, etc. Since we were also staying there as guests (and not Disney Vacation club members) we got full hotel services (towels changed daily, they ran the dishwaster, clean the room daily etc.) Another compliant I read about in other blogs was the small cafeteria (Artist’s Palette). It is one of the smallest cafeterias I have seen on Disney Property but considering the resort is all about having kitchen’s within the units, it makes sense. We were there during busy times and there was not too much wait to get food or check out, but it was borderline close to being a problem. However, we probably would have not even stepped foot into the place if we had stocked up our kitchen, which is what we would do on a return trip. Needless to say, after reading other reviews before we got there, I was a bit nervous. However, while other reviewers were correct (issues with the decor, cafeteria, buses), we thought, in our own experience, that they were minor and were outweighed by the other benefits – especially the more elbow room than a typical hotel room. Ultimately that was important for us a multi-generational family with two young children and two grandparents. There is a resort for everyone and every family, which is why Disney World has so many. However, I think this is a great one to consider for a large or multi-generational family. For those that have stayed there before (or who haven’t) the resort will be going through a major rehab in the next three years with new decor, new appliances, new colors, new air conditioning and more. We will definitely stay here again. I found it to be a good blend of space, with Disney resort benefits, and we got our Disney visual fix in the parks instead! Some other family friendly features to note, there were a lot of activities happening at the resort like movie nights and parties, roasting marshmallows, and some character sightings! Plus, it is a great property to go on beautiful walks and even rent bicycles. They had bikes with kid seats on the back and even smaller bikes with training wheels so there was a lot of every age group! I also suggest taking the water taxi, just for fun. While it is fantastic to be able to taxi over to Disney Springs, you can also just go on a water ride to the other resorts on the same water way (Disney Riverside and French Quarter and the Disney Key West Resort.) It is very relaxing for young and old. My last reason for suggesting the Disney Saratoga Springs Resort for families is that it is closet to Disney Springs, and as a result you have access to a lot of family friendly restaurants like T-Rex, Rainforest Cafe, and simple places like the Earl of Sandwich or Starbucks. Plus, kids can play at Legoland, splash in some splash zones, and just have fun with street performers! Between the many pools, with water slides, the water taxi, the close bus stops, easy parking, activities and amenities, the larger rooms with kitchens, and the proximity to Disney Springs, it has made it to the top of my list! Want to see a video tour of a suite? Check it out and subscribe to my channel! I’d appreciate it!